CEO Keith Fisher had the honour and privilege of being invited to judge the 2018 Annual Golden Haggis Awards which were held at the Oban Distillery in Scotland on Sunday 25th November 2018. Haggis makers from all over Scotland, from Dingwall in the north to Dumfries in the south met the added challenge of a haggis from Cumbria. 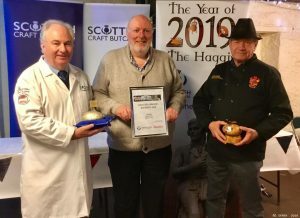 Keith, along with fellow judges, chef/forager Gary Goldie of WildFood and Visit Scotland food writer Neil Robertson decided the winner of the 2018 Golden Haggis Award was McCaskies of Wemyss Bay. Above: John Akroid from McCaskies is presented with both trophies by Douglas Scott and Keith Fisher.